This is a reference page for terminology, logic, and other basic concepts. Apologetics means to make a verbal defense of one’s belief or assertion. It is the opposite of Polemics. A polemic attacks, but an apologetic defends. Exegesis is the critical explanation and interpretation of a text; that is, the application of hermeneutics. Genre is a category or style of literature or art. Genres used in the Bible include history, law, wisdom, poetry, prophecy, and personal correspondence. Grammar is a set of rules regarding sentence structure for a given language. Grammatical Gender is the classification of nouns as masculine, feminine, or neuter. This often has no bearing on the actual biological gender of a person or animal. For example, a man’s hand may be called “she” in Hebrew. The Holy Spirit is “she” in Hebrew but “it” in Greek, even though another word used to describe the Spirit (the Comforter) is “he”. Hermeneutics is the study of the principles and methods of textual analysis and interpretation. Inflection is the modification of a word to indicate its parsing, typically by adding affixes (prefix before, infix within, or suffix after). Paraphrase is the restatement of words within a language. For example, the Living Bible was a paraphrase simply and solely because it restated words from Middle English to Modern English. Parsing is the analysis of all the constituent parts (parts of speech) of a word, such as its mood, tense, voice, number, or gender. Parts of speech are characteristics of a word which determine its relationship to other words in a sentence. These can vary according to language. This link gives some explanation of Greek parts of speech. Polemics means to argue against the truth claims of another. It is the opposite of Apologetics. A polemic attacks, but an apologetic defends. Syntax is a particular application of grammar. Translation is the restatement of words between languages. Thus any method or degree of restating words from Greek to English is a translation. In spite of terms such as literal and dynamic equivalence, it is a matter of degree rather than kind, and the boundaries between any two variations are not at all strict. 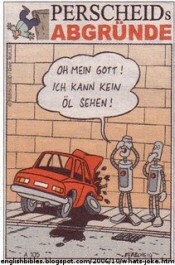 A good example of the imprecise nature of translation can be seen in this German cartoon (source). The word-for-word rendering into English would be nonsense: “Oh my God! I can no oil see!” The literal rendering would be little better: “Oh my God! I can’t look at oil!” But if we wanted the English reader to get the joke, we would render it like so: “Oh my God! I can’t stand the sight of oil!” Thus any understandable translation must consider figures of speech, genre, and the thought being conveyed over sheer technical accuracy. This is not an exact science. Transliteration is the conversion of text from one character set to another with no attempt to convey its meaning. A commonly transliterated Greek word is baptizo as baptism, while the translated word would be immersion. Many debates and discussions are stalled or sidetracked by the poor use of reasoning skills, more formally called logic. Logic is not something only used in a secular environment, nor is it inherently worldly or dangerous. In Isaiah 1:18 God invites people to “come and reason”, and in 1 Cor. 14:33 he is described as “a God of order”. Orderly and disciplined thinking is much wiser than superficial or undisciplined thinking. So it is important that we all have at least some education in the basics of logic. ad hominem circumstantial – attributing an argument to the opponent’s circumstances. A common example is when someone’s argument against hierarchy is blamed on their allegedly having been hurt by authorities. Another obstacle to logical thinking is the use of sayings or clichés whose meaning has changed or been misunderstood. Arguably the best example of this is the phrase, “the exception that proves the rule“. To “prove” means to test, as in taking a car to the “proving grounds”. If a rule is made, then it is tested by any exceptions that are found. That is, the rule is actually disproved by the exception. But most people mistake it to mean that the exception proves the rule to be true, which is nonsense. A practical example would be where someone claims that all lawyers are crooked, but then a non-crooked lawyer is found. The presence of the non-crooked lawyer disproves the rule. The one making the claim cannot simply brush aside the exception. By literal, we mean that unless there is a compelling reason to allegorize or spiritualize a passage, it should be taken as written. This is the opposite of interpretation according to preconceived beliefs. For example, if one wishes to see whether the Bible treats miracles as actual events or simply as moral lessons, one examines the text to see whether the writer is teaching or simply reporting. On the other hand, if one has already decided that miracles are impossible, then that person would be forced to interpret accounts of miracles as moral lessons, without regard for the context. And when we consider the fact that the Christian faith hinges upon a colossal miracle, the resurrection of Jesus from the dead, an a priori disbelief in miracles is wholly incompatible with the Christian faith. What literal does not mean is to ignore figures of speech, analogies, or genre. If, for example, we read that we are to be salt and light, the literal hermeneutic does not teach that we must become pillars of salt or oil lamps. Yet when we read that Jesus rose physically from the dead, we take it as stated since it is in the context of eyewitness testimony rather than analogy or a spiritual teaching. This distinction becomes critical at such points as when Jesus told his disciples that the bread and cup were his body and blood. It is equally critical when we read prophecy. By historical, we mean that a passage must be considered in its context, which includes not only the writer and subject, but also the language, culture, era, and particular circumstances. We must also establish the fact that the Bible is not to be dismissed as historical record, simply because it’s the Bible. All historical accounts are subject to the prejudices and cultures of the historians, who are all fallible human beings. A historian writing about science can be every bit as mistaken or agenda-driven as any theistic writer. So the prudent student of history will consult many historians, many records, and take them as a whole. The character of the historian is of the utmost importance, because even the most erudite prose is worthless as historical record if it omits pertinent data or twists facts. By grammatical, we mean that one must have a good grasp of the language of a writing. In ancient times, there were far fewer people writing at all, so there was a greater degree of consistency in a given era. But languages are always in flux, so the style of writing or use of grammar is one of the clues used by analysts to determine the approximate date of a document. So we must consider the meanings of words as they relate to other words around them, the style of the writer, the general style of the time, and of course the topic; words are not written in a vacuum. The careful exegete will consider all of these factors together, and this requires a lot of time and effort. Much time is wasted debating various Biblical issues due to the fact that people are not all using the same hermeneutic. If one uses the lit. / hist./ gram. method, while another considers all of scripture to be moral lessons, they will never reach any agreement or understanding, with each side wondering how the other can be so blind. On more focused topics such as prophecy or Christian living, the views of each side concerning various groups such as Jews, Gentiles, and Christians will determine whether they can discuss the topics at all. They must first come to agreement on the foundational presumptions before a discussion of details can begin. One great source of confusion and controversy in NT studies is the precision, or lack thereof, in stating times of day. This becomes a critical issue when studying the matter of exactly what day of the week Jesus died and how long he was in the grave. But it can be fairly easily resolved by knowing what the writers meant by “hours”. The whole time from the third hour to the sixth, that is, from nine to twelve, was called the third hour; and the whole intervening time from the sixth to the ninth, that is, from twelve to three, is called the sixth hour. John does not say it was the sixth hour, but about or near the sixth hour. So when he says about the sixth hour, and Mark the third hour, we are to understand that Mark takes the whole time of the third hour, from nine to twelve, and that John puts it near twelve. So in either case our Lord was sentenced between the hours of nine and twelve. Thus we see that there is no need to speculate whether this writer used Roman reckoning and that one used Hebrew, and no basis for the skeptics’ charge of contradiction. With this knowledge we can then determine that Jesus was sentenced around 11 am, crucified by noon, darkness came till about 3 pm, and his death near 6 p.m. Combined with an understanding of the pertinent religious festivals, we can reach a more plausible conclusion as to the details of Jesus’ final week as a mortal.